We spent a long weekend in Madrid for my parent's last weekend visiting us. They were flying out of Madrid, so it was the perfect excuse for all of us to take the train up and spend a few days in the city. Now, I had been to Madrid before (like 10+ years before) and was not a fan. In my defense, I was expecting a very large and busy city like Paris or London, but in reality Madrid is quite small. I was also not expecting everything to be shut down for comida (lunch time -- 2pm-5pm) in the capital city, but it was... So back then, I would not have recommended visiting Madrid, but this time around I LOVED it! Obviously Madrid is still smaller than most other large European cities, but this time I enjoyed that we didn't have to take the metro to get from one part of town to the other; we could walk. Madrid has become very pedestrian friendly (many roads have been converted into walking streets while the cars have been moved underground). And I was pleasantly surprised to find that many stores now stay open during comida. So here is our weekend in Madrid! The train ride up was easy and very painless -- you basically arrive at the train station 5-10 minutes before your train departs, get on the train, find your seats and just relax! Well, if you didn't have a toddler you could relax, but traveling by train with a kid is extremely easy and so much better than an airplane! No security, don't have to stay in your seat, can walk the aisles... It's great! We arrived in Madrid in the later afternoon and made our way to our AirBnB which was in a perfect location (we stayed in the Plaza Mayor/Royal Madrid neighborhood (or barrio)). We stayed in a 3 bedroom flat which was perfect for all of us and it was nice to have a full kitchen when we opted to eat dinner in one night. Our first night we simply walked around, enjoyed the lovely weather and our adorable neighborhood. 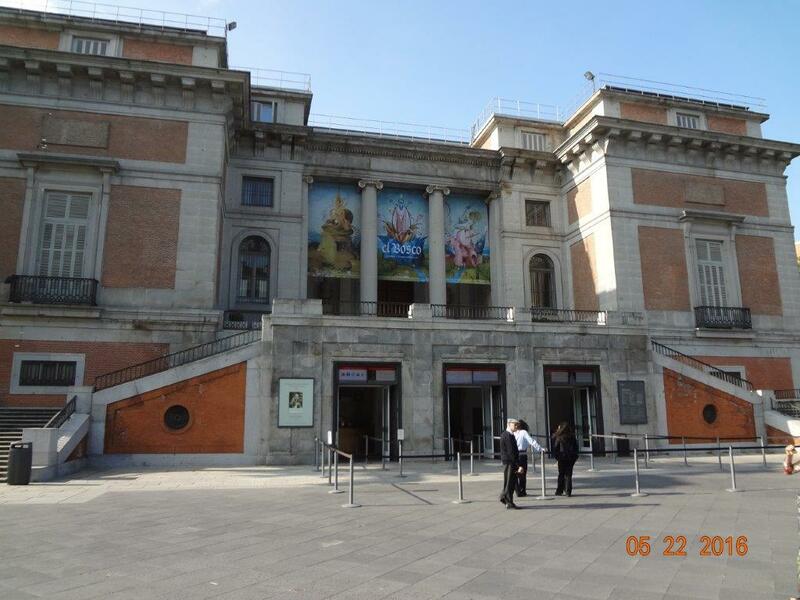 The next morning we went to the Palacio Real de Madrid (Royal Palace) (it opens at 10am and we decided to get in line early because buying tickets online was not an option). The wait wasn't too long and a good place for kids to run around if needed. The Palace used to be where Spain's monarchy lived (but they have since moved to a different palace) and was built in the 18th century -- because the original palace burned down so this was the rebuild. The palace is quite large (2,800 rooms) and really cool to see. It is still used today as the ceremonial palace when needed. We opted to bring our stroller because it was too hot to wear Serafina -- and the workers were wonderful. They allowed us to take an elevator up to the 2nd floor which was an insanely nice elevator by the way and were very sweet to our Peanut as she was walking around. (Many rooms in the Palace did not allow photography to preserve everything). Then for the afternoon we went shopping! Madrid is home to the most amazing department store (for lack of a better word) ever: El Cortes Inglés -- and this is saying a lot because I am pretty obsessed with Galeries Lafayette in Paris. El Cortes Inglés literally has everything (food, fashion, shoes, housewares, electronics, books.... everything) and is four different buildings. Two of the buildings have 9+ floors -- you need a map or you will get lost. And Madrid is also home to the flagship Zara store. Madrid has some wonderful shopping and I highly recommend taking an afternoon to shop -- even if you don't buy anything, it is worth looking! That evening we had a very touristy dinner in Plaza Mayor which I also highly recommend. Yes it is more expensive and yes it is touristy, but you are a tourist! And the people watching is amazing. Madrid is home to some amazing (if not the best) nightlife in all of Europe, therefore making it the place to go for bachelor/bachelorette parties. Everywhere we went, we saw various groups of men and women who were out for their parties -- all were dressed up and all were loud and rowdy! Plaza Mayor was also the place to be the next day because the Copa del Rey (King's Cup) final -- annual soccer (football) competition for all Spanish football teams -- happened to be occurring in Madrid and it was a fun and crazy madhouse with football fans. Lots of drinking, singing and yelling but oh so fun to watch! But back to food -- Madrid has some wonderful food, especially tapas bars. In Madrid, you will often get a small free tapas (think olives, some veggies) with a drink order. So just find a busy bar with lots of Spanish people and you'll be in luck (but remember, if you are going to a local place -- dinner will not be served until after 8pm)! Also wander through the Mercado de San Miguel which is right by Plaza Mayor. It is a high end marketplace with various food vendors. Again very touristy and expensive, but worth a wander through -- go without your kid (take turns watching the babe in the area in front of the market). And have churros con chocolate at Chocolatería San Ginés -- it is worth the wait. The churros are hot and the chocolate is so thick it sticks to your spoon. Amazing. And don't judge us for giving some to our child -- she can't be in Spain without eating churros con chocolate, especially at the best place in Madrid! It also should be noted that this was the first time we were met with some apprehension (from the workers) about having Serafina in the museum. We did our best to keep her in the stroller as much as we could but girlfriend wanted UP (her most used word to date). The staff let us know (not so nicely) that we were to keep her close and not even let her touch the ropes, so we did our best. She is obsessed with animals so we would carry her around and let her look at pictures of animals. My favorite was when we were in the long (long) hallway of paintings and she screams out DOG while pointing to a dog in a painting! All eyes on us -- oops! This was also the place where she learned to say horse. However, she says "bido" which is her way of saying caballo (Spanish for horse). Adorable. We finished out the day with more walking around and some shopping. I also made a short stop at the Atocha train station. This is Madrid's main station and while we arrived here, we took the metro to our flat without coming out of the station. 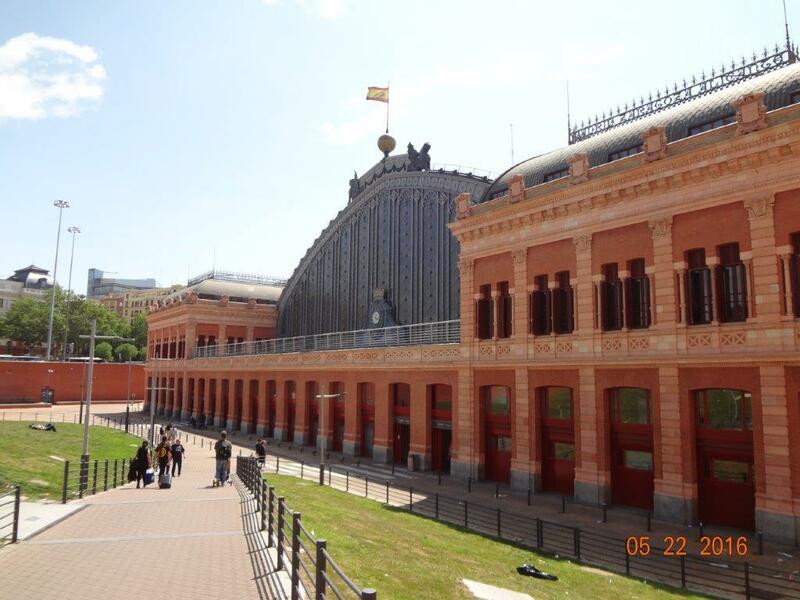 This is the train station that was bombed in 2004 (shortly after my first trip to Madrid). And it is the coolest train station I have ever seen and it is one of the only places I remembered from my last time in Madrid. The whole inside is like a greenhouse with gorgeous plants, flowers and turtles -- so many turtles. And then sadly, our weekend came to an end -- Trevor, Serafina and I took the train back to Rota while my parents flew home to the states. It was such a fun way to end an amazing few weeks with them. And I am so happy I made the return trip to Madrid because I now love it! 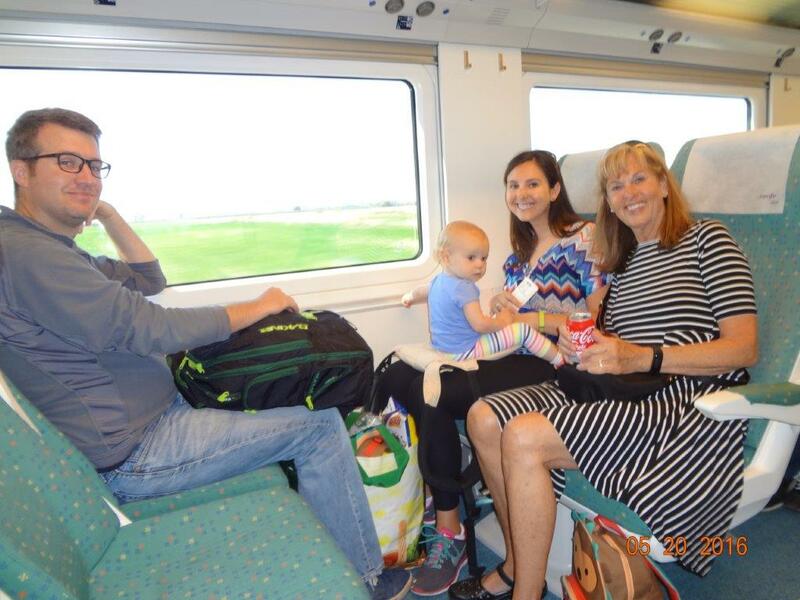 A few toddler travel tips: Madrid is another very stroller friendly city! We only took the metro on our way to our flat but found that we didn't need to take it any other time. Everything was within a 25 minute walk maximum. We also made it a point to have one of us go back to the flat with Serafina for a break each afternoon. This allowed her to run around safely, play with toys and also take a nap if needed. It made for a much happier Peanut which in turn made for happier parents and grandparents. I highly recommend sticking to one major tourist attraction per day and allowing for some down time for your toddler. While this is very different from the go-go-go travel that we used to it, it is what now works for us and our family. 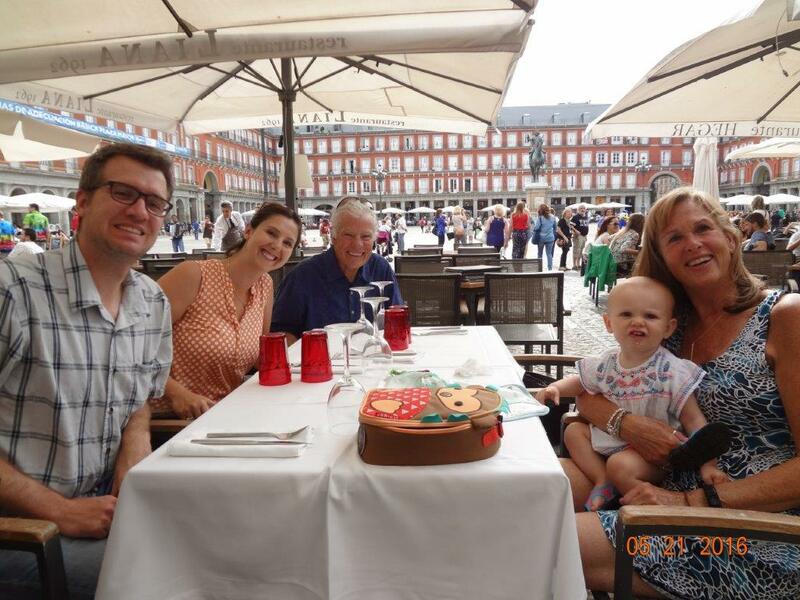 We loved Madrid and it is a very kid friendly city -- highly recommend to all families traveling in Europe! Recently on a long weekend trip to Croatia, we had a long layover (like 18 hours) in Madrid -- so we made the most of it and had a blast bar/restaurant hopping and eating so well for one night! Highly recommend staying here -- close to a metro stop and also a really clean and nice place. I also recommend Carmancita Bar for dinner (or breakfast), the food was so yummy and the place was quaint and adorable. El Jardin Secreto is a crazy and eccentric bar/restaurant with an extensive menu but it was pretty fun and worth a drink at least to just stare at all the random and elaborate decorations! And of course, I have to recommend Serafina Cocina Bar -- for the name but also for the decent gin list (just note that the Puerto de Indias gin (amazing gin from Sevilla) on the list is the pink/strawberry gin and I do not recommend).